Cartagena holidays take you to a fascinating port on the south east coast of Spain. This historic town has many fine buildings reflecting architectural styles through the ages, and the castle above the town on La Concepcion Hill, is at the top of most sightseeing lists. Holidays to Cartagena can be taken from April until October with temperatures rising to the low thirties at the height of the season. With no town beach, holidays in Cartagena are more popular with couples and young adults, rather than families. Having said that, there are some wonderful beaches nearby. 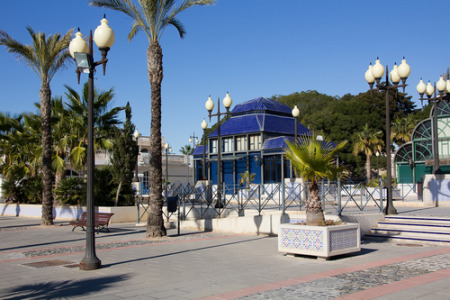 These include the salt lagoon, Mar Menor, which is a great centre for water sports. We have a number of cheap Cartagena holidays that are considered great value for money as our commitment to quality and service are never compromised. Apart from sightseeing in the town, there is a choice of courses for golfers and there are also opportunities for tennis, rambling in the hills, cycling and horse riding. Our low cost Cartagena can be as relaxing or as energetic as you wish. Accommodation is good, restaurants cater for all tastes and shops supply all your holiday needs. There is nightlife to suit all moods from vibrant bars and discos to venues where you can relax with friends. If you are seeking an escape to the sun, but don't want a beach holiday, you may be tempted by our Cartagena holiday offers. For further details, and to discover our last minute Cartagena holidays, please use the search facility.